10 a.m. to 6 p.m. Mon.-Fri.; 10 a.m. to 5 p.m. Sat. Stop in at Best of Times for your gift-giving needs, or simply treat yourself to something special. 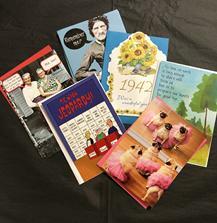 We're known for our wide assortment of greeting cards, whether they're funny, serious or supportive. Our customers tell us they love shopping here because they find gift items they just don't see anywhere else. We get new shipments every weekday, so the stock is always fresh. Copyright Best of Times Cards and Gifts.